For a Cookie Pizza kids cooking party, kids get a chance to prepare the cookie batter and decorate the pizza. You can make a giant cookie pizza in a pizza pan or individual cookie pizzas using a round circle cookie cutter. You can have the kids make the dough and do another activity while it is baking or have the cookie/cookies already made and ready to decorate. Once you know the number of children coming go through the list of things needed especially utensils, bowls, etc. If you need extra ask friends or family if you can borrow some items for your Cookie Pizza kids cooking party. Have kids take turns adding ingredients allowing everyone a turn adding and stirring. In mixing bowl, cream together butter, sugar, eggs and extracts. Blend together. In separate large bowl, add flour, baking soda and cream of tartar. Add to creamed mixture and blend together. Roll dough out on floured surface and cut out with round cookie cutters for individual size cookie pizzas. Or if you are making a giant cookie pizza press dough into a greased pizza pan. Bake at 375 degrees for 7-9 minutes. Another option for a large cookie pizza is using brownie mix in place of the sugar cookie dough. While an adult bakes and allows cookie pizza to cool prepare fruit topping. If kids are old enough to cut and chop fruit, cut fruit into slices. If you have a younger group prepare this ahead of time or have the adult who is baking cut fruit while kids play cooking games, decorate aprons or hats. 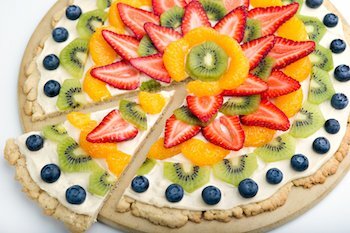 When ready have kids frost cookie pizzas and top with fruit. Back to Kids Cooking Party from cookie pizza kids cooking party.